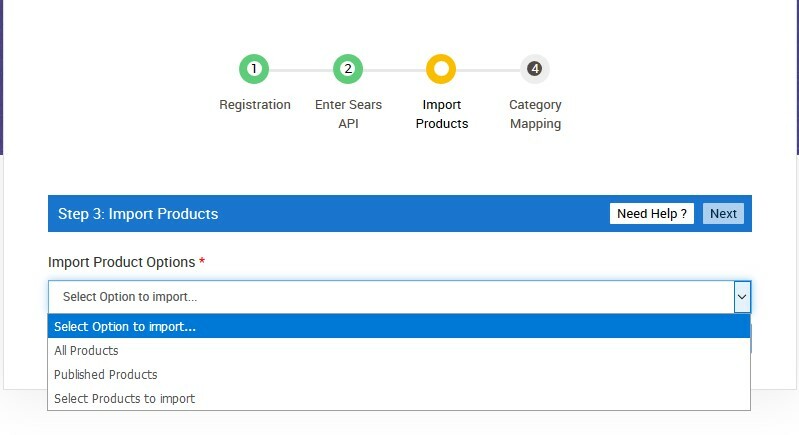 Once the Sears Marketplace Integration app is successfully installed in the BigCommerce store and the API credentials are received from the Sears Seller Account, the admin has to follow the Registration process and set up the configuration settings to establish the connection between the BigCommerce store and sears.com. In the left navigation panel, click the Apps link. In the right panel, click the Launch button. First Name: First Name of the Store Owner. Last Name: Last Name of the Store Owner. Mobile: Mobile number of the Store Owner. Annual Revenue: Select the required option from the list. 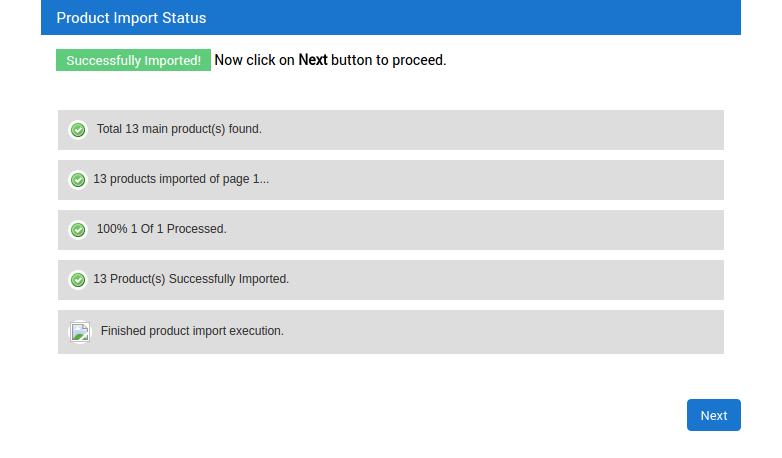 Country: Select the required Country from the list. 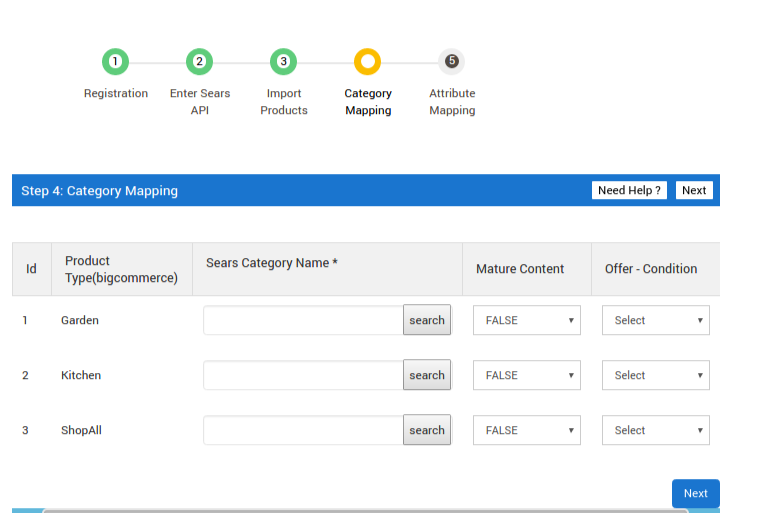 Are you already selling on Sears Marketplace? : Select the required option from the available list. Under Terms and conditions, read the content and then select the checkbox associated with the I Accept Terms & Conditions text. In Seller Id box, paste the Seller Id copied from the Sears Seller account. In the API Authorization Key box, paste the API Authorization Key copied from the Sears Seller account. In the Location Id box, paste the Fulfillment Locations Id copied from the Sears Seller account. In the Seller Email box, enter the email id of the seller. 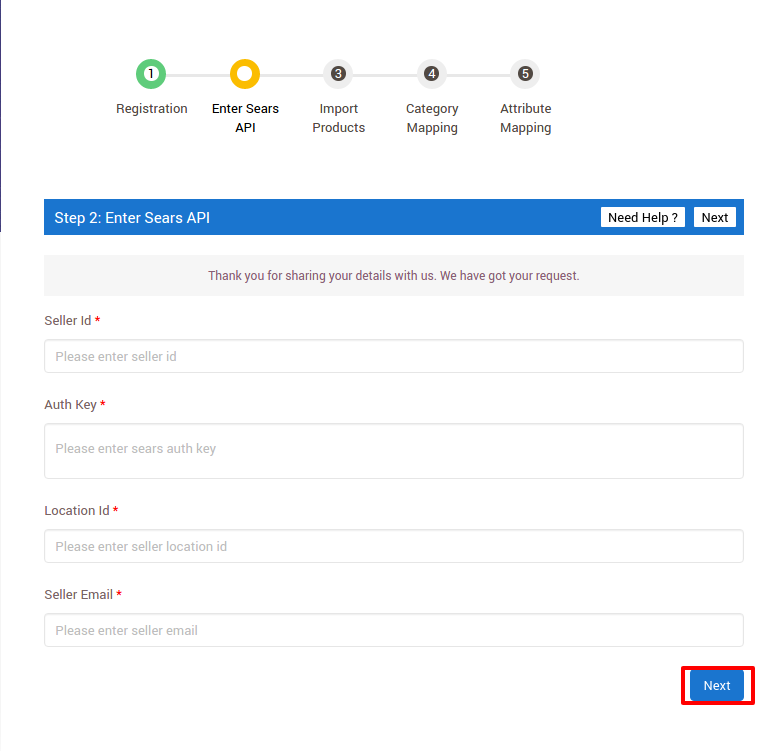 Select Products to Import: It enables the store owners to import only those products which they want to upload from their BigCommerce store to the app. Scroll down to the required Product Type. In the Sears Category Name column of the respective Product Type, enter the initial of the category to search, and then click the Search button. A category list appears as shown in the figure. 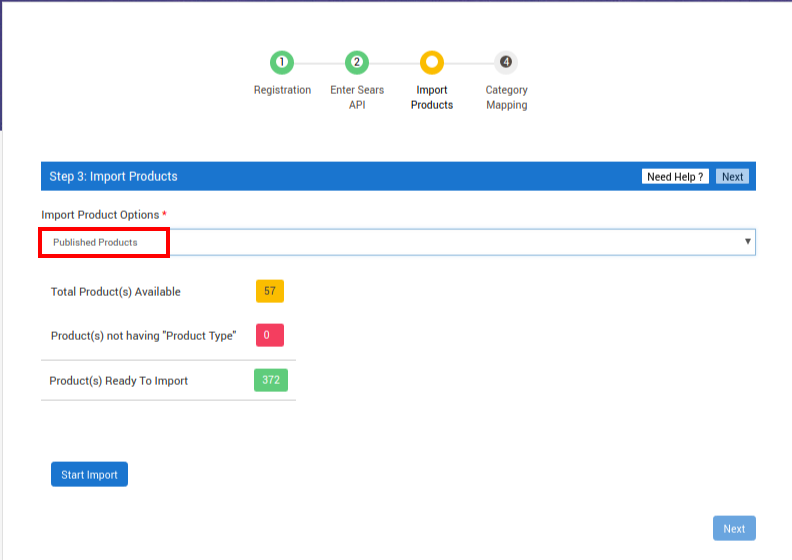 In the Mature Content list of the respective Product Type, select the required option. 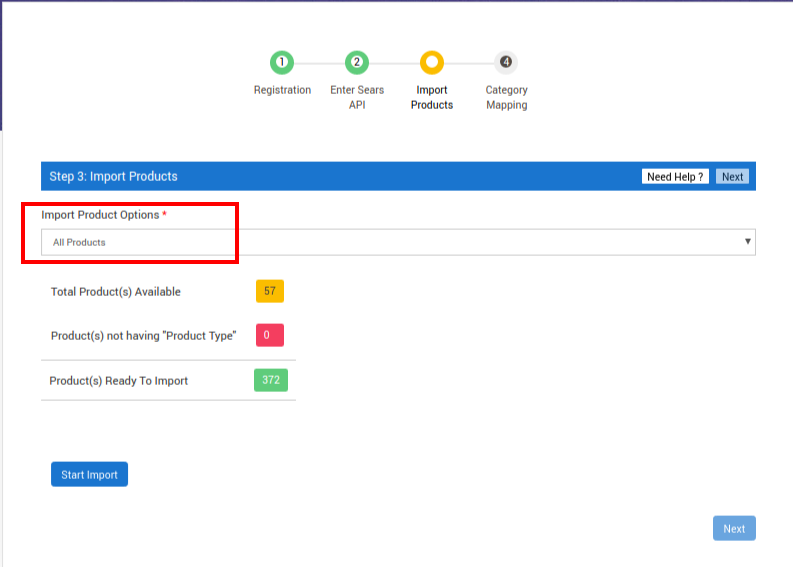 In the Offer – Condition list of the respective Product Type, select the required option. Scroll down to the row of the required Sears attribute. 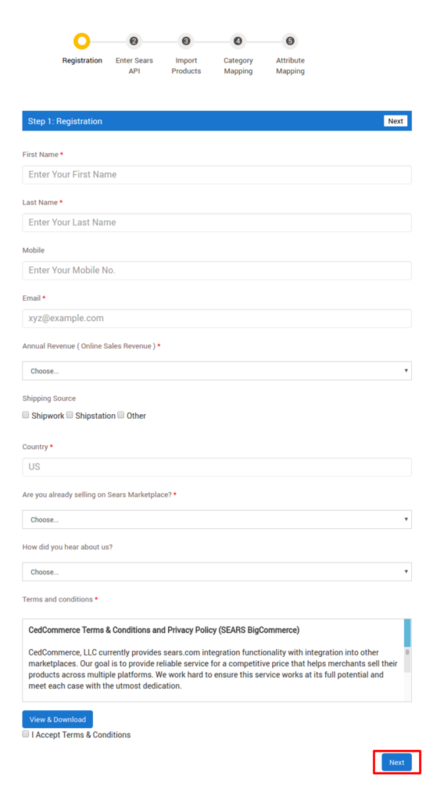 In the BIGCOMMERCE column of the respective row, select the checkbox associated with the appropriate Bigcommerce options for the Sears attribute. 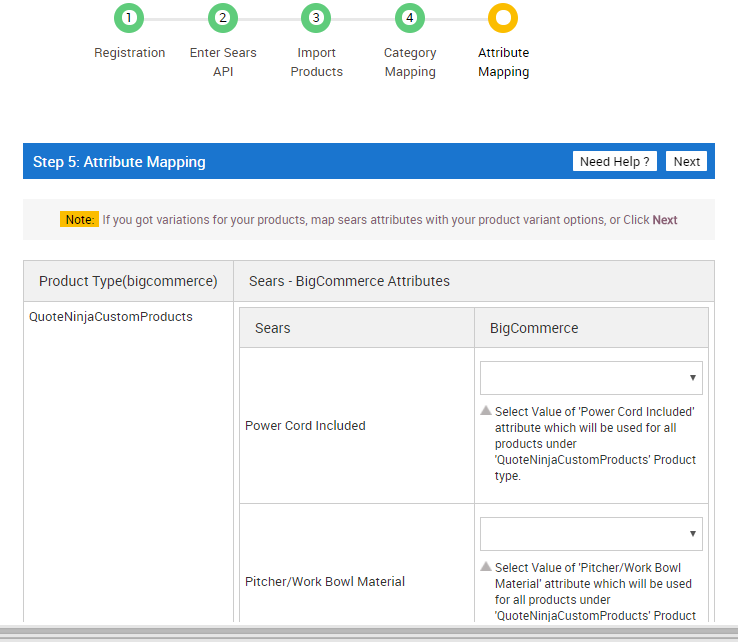 If the store owners have the variant products in their store then they need to map the attributes. Variant Products mean, the products having various attributes such as color, size, metal, and so on.